And we hadn’t even stopped and one of the ladies jumps in the water and I’m like, “What the hell? That’s crazy.” I’m like blown away. I’m like there’s no chance I’m not getting in there right now. If she comes up and she’s been bitten, we still got to go in and get her. Fortunately for us, as soon as we got in the water, I’ve never been so calm. Everything she told us about the sharks was spot-on. It seriously was a life-changing moment for me. I was, like, this is awesome, to share their environment with them while they are just hanging out and they will not bother you. There’s no other predator that you can do that with. 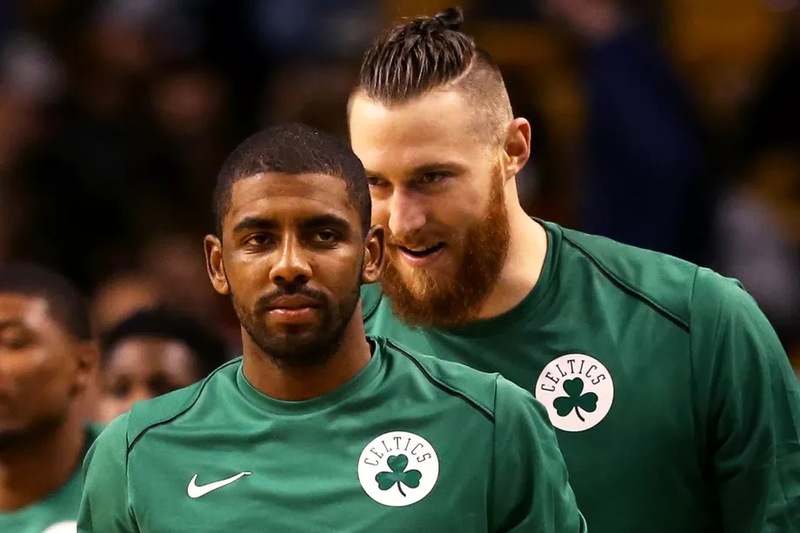 Aron Baynes on Tommy Heinsohn's comments: "It's always nice to get a compliment from a Celtics legend ... The Missus got a few texts." Q. Tell me something about Kyrie that nobody knows. All you hear over and over is that he believes the world is flat. A. I think that’s just a talking point for him. I’m not too sure that he believes that. That’s one of those ice-breakers. I call it the “pink drink.” When I used to go out into the clubs, I’d get a drink that pretty much looked pink and it would be a conversation starter. So I think Kyrie’s talking about a flat earth is just his pink drink. We can picture this. A monster of a guy comes into a bar, and the patrons expect he will order a huge mug of beer or bourbon on the rocks. Instead, the waitress brings a fluffy, pink drink with maybe a mini umbrella in it. Just for effect, to get attention and possibly to start a conversation. If you are a true NBA basketball fan, you want players who are winners but can also be characters off the court. Dennis Rodman in a dress never did it for me, but I will take these two guys any day. Before he came here, I had little idea just who Aron Baynes was, and I never thought of Kyrie as having this type of vibrant personality. Great to have both as Boston Celtics.